As the fashion market is revolutionized over time, many new styles of winter clothing like colorful sweaters, trendy jackets, and functional rain mac come into light. Winter clothing is no more boring and dull, trendy colors and styles capture the market offering you to look outrageous throughout the season. Available in plus sizes this beautiful color block Corduroy jacket is a standout piece which definitely upgrades your winter styling. Made up of cotton and polyester the jacket is wide-waisted and is of regular length. For decoration, it has pockets and patchwork pattern. Talking about other features then it has a turn-down collar, full sleeves, and single breasted closure. Perfect for the fall season pair this trendy jacket with blue jeans and casual shoes for a captivating style. Wants to continue your passion for crop styling then buy this crop zipper style Corduroy jacket from ZAFUL which gives you the freedom to flaunt your slim waist. Made up of cotton this jacket features white polo collar with eye-catching red trim on the front. This fashion style jacket features high-waist, full sleeves, front zipper closure, and can be dressed in while going out with the friends. Pair it with your favorite bottom for a perfect casual look. Look ultra-chic in the fall season with this yellow color Corduroy jacket. Complement the jacket with a white tee, black bottom, and black ankle length boots for a graceful styling. Made up of polyester the jacket is ideal for the autumn, spring, and winter. 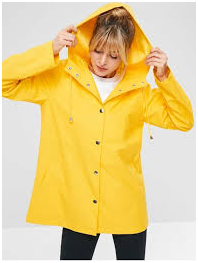 This cute yellow jacket also features shirt-collar, regular length, full sleeves, and single breasted closure. For decoration, this solid pattern jacket has front pockets. Perfect for a casual look this ZAFUL Corduroy jacket is cozy as well as stylish make you look like a style chic. Crafted from polyester the jacket is wide-waisted and is of regular length. The drop shoulder gives a funky look to the jacket. 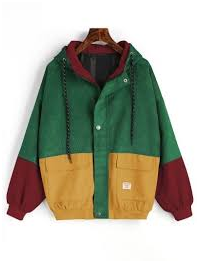 The jacket is loaded with features like it has stand-up collar, zipper closure, full sleeves and beautiful patchwork of solid colors. Fabricated from polyacrylic and polyester this brown color Corduroy jacket is a comfortable and cozy article suitable for the fall season. It features regular length, turn-down collar, single-breasted closure, and is ideal for daily wear. Pair this warm jacket with turtle-neck tee and black bottom to complete the perfect winter look. Click here to grab this article.